Mysticism is older than religion; in fact it is as old as mankind. Listening to music can provide a range of experiences from the entertaining to the ineffable, and at the highest level listening to music can be a mystical - which is very different to religious - experience. There are many great traditions of mystical music, and the music performed at Sufi rituals is one of those great traditions. In recent years there has been a revival of interest in mystical art music, possibly as a reaction against the attempted annexation of Western classical music by the entertainment industry. Sufi music ranging from the chants of brotherhoods from al-Ándalus, through electro-Rumi in Istanbul and esoterically inspired jazz in Aleppo, to Qawwali at the shrine of Hazrat Nizamuddin Aulia in Delhi has featured On An Overgrown Path over the years. I was therefore delighted to be commissioned to write the programme essay accompanying two performances of Sufi chants by an Egyptian brotherhood at the Ouverture Spirituelle sacred music festival that formed part of the 2014 Salzburg Summer Festival. The accompanying photos show the Sufi brotherhood Al-Tarīqah al Gazoulia led by Sheikh Salem Algazouly in the Catholic Kollegienkirche during their Salzburg performances. My essay is reproduced below and the companion piece written for the premiere of a work by the Palestinian-Israeli composer Samir Odeh-Tamimi celebrating the 9th century Sufi martyr Manṣūr Al-Ḥallāǵ can be read here. 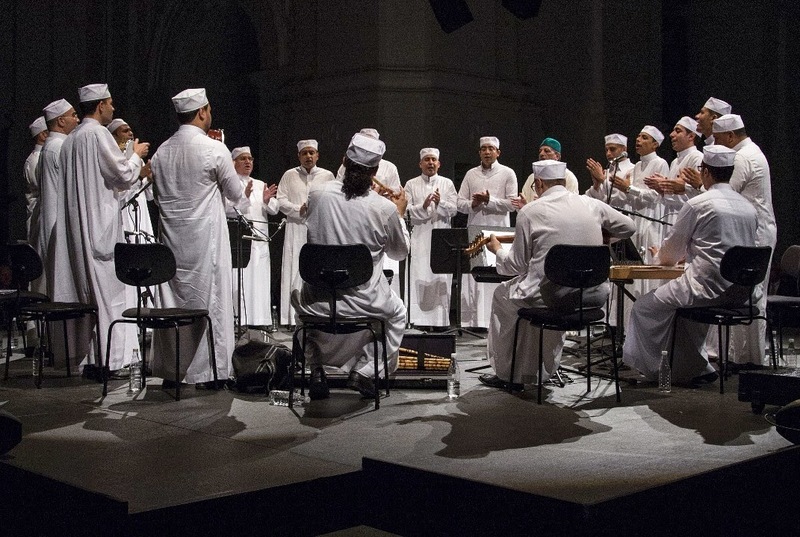 The Ouverture spirituelle at this year’s Salzburg Festival celebrates the sacred music of Islam, including two evenings of Sufi chants by Al-Tarīqah al Gazoulia. Yet resonances of the universal tradition of Sufism can also be found in several other concerts within the Festival. Daniel Barenboim and the West-Eastern Divan Orchestra perform Act II of Wagner’s Tristan und Isolde and while the influence of the Eastern esoteric tradition of Buddhism on Wagner is now acknowledged, less attention is paid to the echoes of Sufism also present in his music dramas. In 1921 the Sufi master and musician Hazrat Inayat Khan wrote that ‘Wagner did but repeat the teachings of the mystics of the East when he said that he who knows the law of vibrations knows the whole secret of life’. Another notable concert this summer features Pierre-Laurent Aimard playing the first book of Bach’s Das wohltemperierte Klavier and both Bach’s music and Sufism are notable for challenging fixed and widely accepted propositions. The two performances by Al-Tarīqah al Gazoulia of Sufi chants within the Ouverture spirituelle are evidence of the rejuvenation of a spiritual tradition that dates back to the ninth century. In recent years Western interest in Sufism has focussed primarily on the founder of the Mevlana Brotherhood, Jalaluddin Rūmī. Members of the Mevlana Brotherhood from Konya in Turkey are famous as the Whirling Dervishes and the popularity of Rūmī’s vibrant poetry has propelled him to the unlikely position of America’s bestselling poet. But Rūmī and the Whirling Dervishes are just one aspect of a multifaceted tradition that the West still struggles to define and understand. In fact Sufism transcends Western mindsets and the Syrian poet and essayist Adonis has expressed the view that the movement towards Sufism came about because religious orthodoxy and science were unable to answer many of the profound questions posed by man. Sufism rejects the notion of God as a separate entity, instead seeing Him as a presence in every human heart. The goal of Sufism is to make its followers absent from themselves and present with the Infinite, with music and ritual playing an important role in this transformation. The enigmatic nature of the tradition is illustrated by the Sufi saying, ‘in the beginning Sufism was a reality without a name; today it is a name without a reality’. Western scholars have long pondered over the name Sufi. They have suggested several possible meanings based on the corruption of various words: these include the Arab for wool, ṣūf, in a reference to the white woollen cloaks worn by early adepts; the Greek, sophia, referring to the adept’s wisdom; and the Hebrew, ein sof, suggesting the adept’s path ‘without end’. But it has to be accepted that there is no neat definition of Sufism to suit empirical Western outlooks and, equally problematically, it must be accepted that there is no definitive source for the Sufi vision. Uniquely for a religion, Sufism lacks both founder and dogma, allowing for widely varying interpretations of the tradition. The Sufi vision is not definitively articulated in the Qur’an or in the sayings of the Prophet Muhammad. However Sufism is most widely known as a mystical form of Islam with its roots in an esoteric interpretation of the Qur’an, with Islam and Sufism being inextricably linked in the many brotherhoods that are active from Morocco to Indonesia. Sufism – or Taṣawwuf as it is known in the Muslim world – is seen as a liberal expression of Islam and this has resulted in the persecution of its adepts by fundamentalist factions over the centuries. In 922CE the Sufi mystic and teacher Mansur al-Hallaj was publicly executed in Baghdad for his heretical beliefs; his martyrdom is commemorated in two works performed as part of this year’s Ouverture spirituelle. Conversely, Turkish Sufis, including members of the Mevlana Order, were persecuted by Kemal Atatürk’s secular regime. To understand the spiritual link between Sufism and music it is necessary to understand the structure of a Sufi ritual. The journey from the visible material world to the divine and invisible inner world takes place during a ceremony known as a zikr, which translates as ‘remembrance of God’. The zikr generates the state of spiritual ecstasy or trance known as wajd, with fanā being the ultimate goal. Fanā literally means to be dissolved or annihilated and it refers to the negation of the self that is required to achieve union with the Infinite. The form of the zikr varies between brotherhoods, but in most, including the performances by Al-Tarīqah al Gazoulia, both chanted and instrumental music play an important role. Just as there are many definitions of Sufism, so there are many types of Sufi music. Most familiar to Western audiences are the sounds of the ney, tanbur, kemenche, oud and qanun that accompany the Turkish Whirling Dervishes, as well as the ecstatic singing of Nusrat Fateh Ali Khan and other great qawwali singers from Pakistan. Less familiar is the more nuanced music found in the rituals such as those of Al-Tarīqah al Gazoulia. In these, the order (tariqa) is led by a spiritually empowered master (sheikh) in a rhythmic sequence of chants of increasing intensity that build towards the spiritual ecstasy of wajd. Rūmī summed up this Sufi goal when he declared ‘be drunk on love, for love is all that exists’. The zawiya or Sufi lodge of Al-Tarīqah al Gazoulia is in Cairo. Sufism has been practised in Egypt since the earliest days of the tradition and the Sufi saint Dhu’l-Nun al-Misri (796–859CE) from Upper Egypt is credited with creating the first maqāmāt and ahwal; these are the intermediate states that Sufis pass through on their journey along the tariqa to achieve unity with the Divine. Sufi orders are found today in both rural and urban Egypt; it is claimed that 20% of Egyptians practise Sufism and there are more than seventy brotherhoods across the country, with the majority in the metropolitan areas of Cairo and Alexandria. There is a strong tradition of Sufi music in Egypt, including the great exponent of munshidin (sacred song) Saykh Ahmad Al-Tuni and the Nubian oud player, singer and composer Hamza El Din. The latter performed with the Grateful Dead and his iconic 1971 album Escalay (The Water Wheel), recorded for the Nonesuch label, is reputed to have influenced contemporary American minimalist composers. Sufis have traditionally been tolerant and apolitical, though the Egyptian founder of the revivalist Muslim Brotherhood, Hassan al-Banna, had links with Sufism in his youth and the current turmoil in Egypt has inevitably drawn Sufis into the political arena. 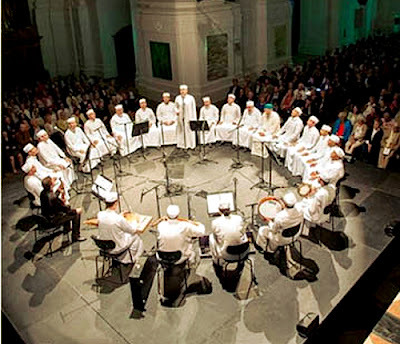 However the Sufi order of Al-Tarīqah al Gazoulia affirm that they are committed to love, understanding and tolerance; when approached, their sheikh Salem Algazouly spontaneously agreed to perform zikr in public for the first time at the Salzburg Festival and the ritual is being celebrated during the Muslim holy month of Ramadan. Joining Al-Tarīqah al Gazoulia for the second of their appearances is the celebrated violinist Frank Stadler, who will improvise on Sufi themes, thereby building a bridge between the brotherhood’s chants and Bach’s music for solo violin. Like Sufism, Bach’s music offers a universal tradition, but it has other links to the path that leads from the visible to the invisible. Recent research by musicologist Helga Thoene suggests that the score of the Chaconne from Bach’s D minor Partita for solo violin (BWV 1004) contains hidden chorale quotations and a recording revealing the quotations proved an unlikely bestseller on the ECM label in 2001. In Sufism sama means listening with the ear of the heart and the audiences at this year’s Festival will be participating, consciously or unconsciously, in a great and universal tradition. After graduating, Bob Shingleton worked for the BBC and EMI Records. During the 1970s he was professionally involved with the Salzburg Festival where his responsibilities included ensuring that photos of Herbert von Karajan were displayed prominently throughout the city. Since retiring Bob has pursued his interest in the more esoteric aspects of music and he writes the arts and music blog On An Overgrown Path.